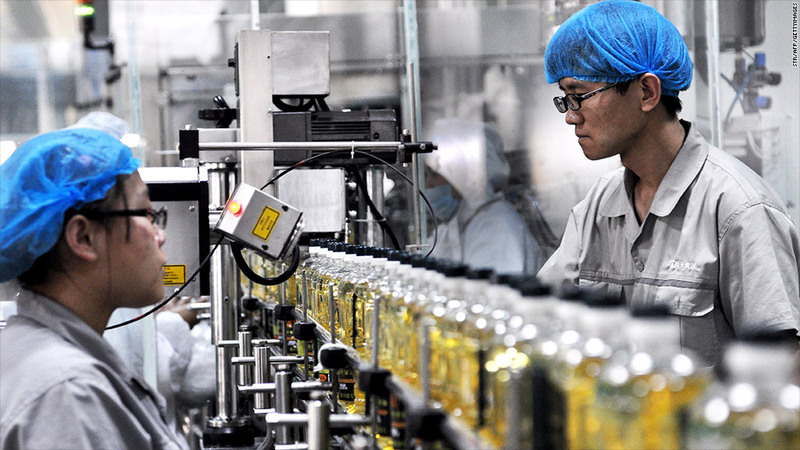 Bottles of corn oil at a factory in Zouping in northeast China. Chinese manufacturing weakness worsened in the latest reading Thursday. China's factories continued to struggle in August, as a key manufacturing reading fell to a nine-month low. HSBC's initial purchasing manager's Index for Chinese manufacturing fell to 47.8 from 49.3 in July, the bank said Thursday. Any reading below 50 indicates that factory activity is shrinking rather than growing. "Chinese producers are still struggling with strong global headwinds," said Hongbin Qu, chief Chinese economist at HSBC. There was a lot of bad news in the latest reading, as manufacturing executives surveyed said all the various components they were questioned on -- employment, production, exports and backlogs of orders -- continued to retreat instead of grow..
"There is scarcely anything positive in the breakdown to report," said Mark Williams, chief Asia economist for Capital Economics, in a note to clients. "Demand appears to have slowed even more abruptly. That suggests output could slow even further." " And it's worth noting that Chinese firms are not the only ones being hit: the July export data for Korea, Taiwan and Japan were all terrible too," Williams added. Williams said in response to the weakness, the People's Bank of China, the nation's central bank, injected 145 billion yuan, or about $22.8 billion, into the economy. Taken together with the 220 billion yuan injection announced Tuesday, that makes for the largest weekly injection of cash by the bank so far this year, Williams said. Williams and other economists are expecting even more loosening of monetary policy in China in the coming weeks and months, including cuts in the requirements for how much banks there must hold in reserve, in an effort to jump start the sluggish economy there. "I think we'll see reserve requirements cut fairly soon," he said. Despite the PMI report, major markets in Asia closed slightly higher, while European markets were all trading slightly higher and U.S. futures pointed to gains at the open. Federal Reserve minutes released Wednesday afternoon lifted investor hopes for more stimulus from the U.S. central bank.